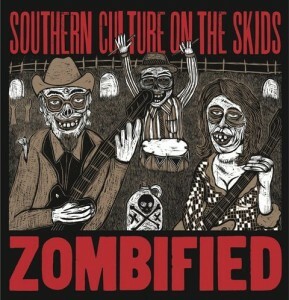 Southern Culture on the Skids has always excelled in good tasty swamp rock. The group’s latest album, Zombified — released this month just in time for the Halloween shopping rush — goes deep into the swamp, where mossy monsters dwell. Like the best SCOTS recordings, the sound here is a seamless blend of country, surf, rockabilly, garage-rock, exotica, swamp-rock, as I mentioned, and probably some secret ingredients the group will never tell. Miller always sounds like a hip bumpkin — whether he’s singing about funny aspects of Southern life or, as on this CD, witches and zombies. Mary Huff plays the bass and sings far too infrequently while Dave Hartman drums. There are a few guests on some tunes, the most significant being Chris “Cousin Crispy” Bess on organ and Steve Grothmann on sax. But there are also some fine covers — a Creedence Clearwater Revival instrumental, “Sinister Purpose”; “She’s My Witch,” a cover of a song by rockabilly Kip Tyler; John D. Loudermilk’s eerie “Torture” (sung by Huff, who sounds like she’s been, well zombified); and best of all, “Primitive,” a garage-y snarler originally done by a band called The Groupies, and probably best known by its version by The Cramps. There are more instrumentals than usual for a SCOTS album. Besides “Sinister Purpose,” there are “The Creeper” — on which Miller’s guitar dares to go delightfully obnoxious trying to summon the ghost of Link Wray, and “Swamp Thang,” which is upbeat, funky, and, naturally swampy. One unusual song here is “Bloodsucker,” featuring an acoustic guitar and a lilting Caribbean/New Orleans arrangement. Trom-bonist Dave Wright colors this track. Even though Zombified is perfect for Halloween spookfoolery, virtually all the songs here stand on their own and would sound just fine at a SCOTS show any time of year. Another monstrous treat ... or is it a trick? * Pop Up Yours by The Monsters. 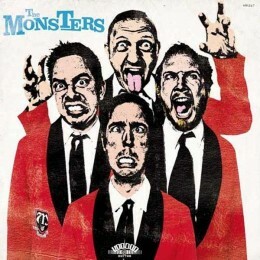 No, this isn’t a Halloween-themed album, but how could I not talk about a new record by The Monsters during this special season? This Bern, Switzerland-based band has been around since 1986, fronted by Reverend Beat-Man, the owner, founder, and resident (un)holy man of Voodoo Rhythm Records. The group plays what it calls “chainsaw massacre teenage garage trash punk.” And they have these really snazzy red jackets. The songs deal with love, lust, revenge and rage, based on simple riffs and Beat-Man’s shredded vocal chords. One of my favorites here is “Blues for Joe.” I don’t know who Joe is, but Beat-Man seems pretty upset as he screams “What you gonna do now, Joe.” Also commendable in its sweet, crazy fury is “Crawling Back to You No More.” There’s a pumped-up Bo Diddley beat at the core of the song. The songs are mostly original, though many of the mutated, frantic Hubert Sumlin guitar riffs sound hauntingly familiar. There is one cover tune, a trashy — and I mean that in the nicest possible way — version of “Speedy’s Coming,” originally done by German metal screamers the Scorpions. The Monsters seem to play with psychedelia on the closing track “Into the Void.” It starts with church bells and ends up with feedback and bashing drums. It’s great that there are still Monsters on the loose. Horrible mention: Here are a couple of recently released albums appropriate for the season. * Halloween Album w/Sound Effects by Thee Cormans. This California band basically plays instrumental “surf” music. Titles include “Surf Shack of Doom,” “Haunted Sea,” and “Werewolves in Heels.” The sound effects are indeed bitchen. * What Happens in Hell Stays in Hell by Nekromantix. Here are more crazed horror-soaked psychobilly sounds from this trio led by Danish expatriate Kim Nekroman, who plays a coffin-shaped standup bass. Some songs sound closer to Slayer than to Carl Perkins. “Bela Lugosi’s Star” has a cool Johnny Cash chunka-chunka beat, and “I Kissed a Ghoul” has a weird reference to the Happy Days theme. 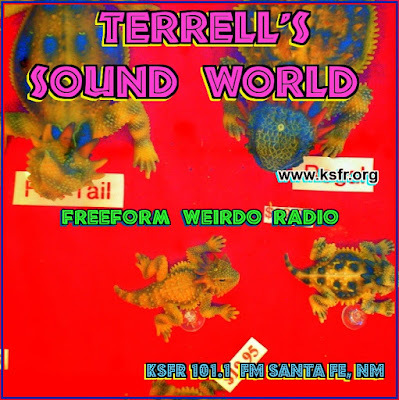 * Radio spookiness: The 87th Annual Steve Terrell Spooktacular starts at 10 p.m. Sunday, Oct. 30, on KSFR-FM 101.1 and screaming on the web. Tom Adler of “Folk Remedy” is substituting for me Friday night on the Santa Fe Opry. 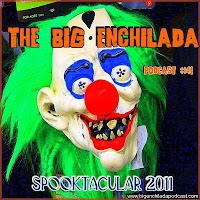 * Podcast spookiness: The 2011 Big Enchilada Spooktacular is scaring people all over the internet. Visit . And if you want even more creepiness, check out the GaragePunk Hideout Podcast Jukebox HERE. 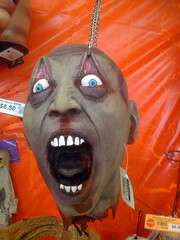 There's several recent shows with ghastly Halloween themes over there.